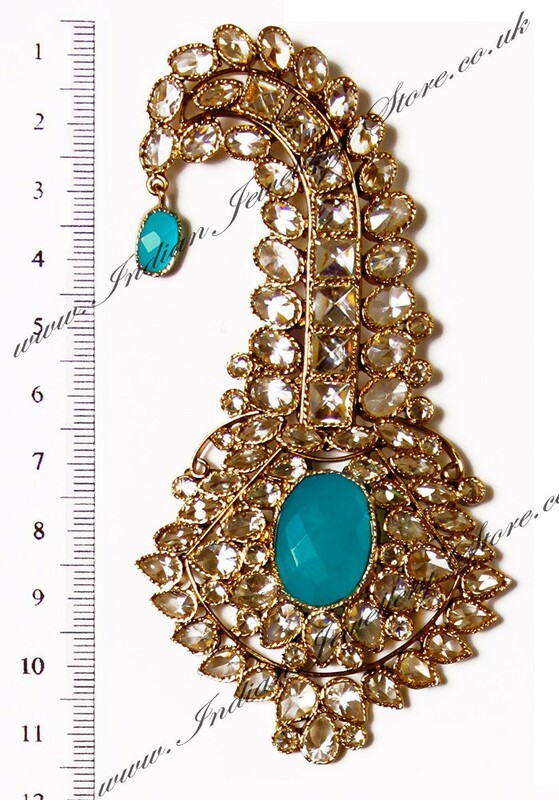 Indian kalgi (turban pin) in Antique-M gold and American Diamond. Set with aqua blue stones. Indian kalgi (turban pin) in Antique-M gold and American Diamond. Set with aqua blue stones. Attaches to turban with hook. Also has a cup for optional feather to come from top. Made using traditional Rajasthani jewellery design and techniques. Inspired by the Bollywood classic film, Jodha Akbar. Indian Jewellery Store LOVES this product. Scale shown in image is in cm.